Yesterday I marathon’d a day-long game of Civilization V while getting over some kind of full-body funk. Not a good P-Funkadelic-funk, but a disease trying to colonize my body and turn me into a meatpuppet for nefarious means-funk. So I sat and played a powerfully long game of Civilization V. It came down to three empires in the end. The Ottoman empire, led by Suleiman, was threatening and overbearing but technologically and militarily inferior to me. I held a single city against them for something like 100 years solid. The Indian empire was slightly larger than my own, more technologically developed, but less economically and culturally developed. I made the United Nations. Gandhi had a majority, voted for himself, and defeated me. I’ve been upset by this since last night. Why did I lose? Why didn’t the game warn me that the state of the world population was such that there was no way that I could win if I triggered a U.N. vote? From a gameplay perspective, I am upset by opacity. That is, there was information available to me that I could not see through the menu system, the advisers, and so on. But the game rendered those things opaque to me; if the information was there, it was imperceptible. I’m unhappy with that in the same way that I would be unhappy with a Magic: The Gathering player who doesn’t explicitly say that her creature has deathtouch. I’m unhappy in the same way that I would be unhappy with a Dungeon Master who didn’t demonstrate through his narrative that the enemy I was fighting was regenerating all of its hit points every turn. You’ll notice that both of the examples that I use are organic in nature–they are situations where humans mediate the rules of games rather than strict mechanical processes. Civilization V‘s lack of communication with me as a player is, to me, unfair feeling. But there is something amazing in the fact that it is unfair in a way that a computer game rarely is. 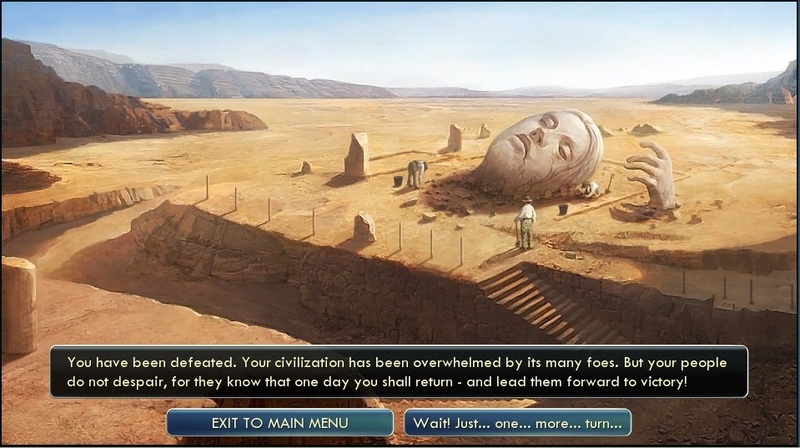 I can imagine, were Civilization V a human being standing in front of me when the game ended, it would have shrugged its shoulders. This entry was posted in Video Games and tagged civilization v, losing, nonhumans, opacity, video games. Bookmark the permalink.